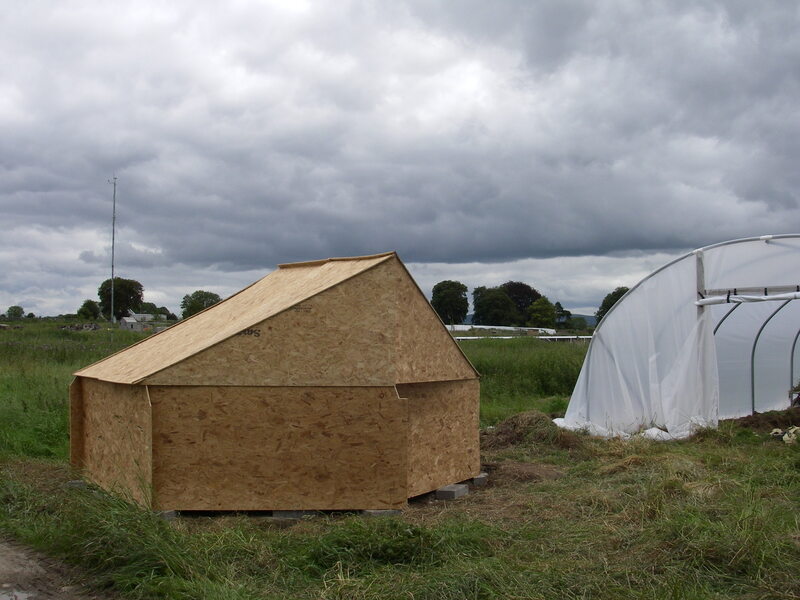 We just built a Hexayurt H13 at the Cloughjordan Ecovillage. The H13 was designed by Scott Davis and Dylan Toymaker. The H13 adds one panel to the “classic” H12 hexayurt, but that one extra sheet of plywood gets an 8′ roof line and three times the walkable space inside the hexayurt. It’s a really beautiful piece of lateral thinking, and I think it’s destined to become the standard hexayurt for any application which doesn’t require the very low wind profile of the H12 or absolute materials efficiency. 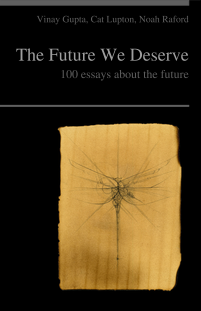 I’m very grateful to Scott and Dylan for dedicating their work to the public domain just like the original hexayurt on which they innovated. This is how the commons learn and grow: we all work together to improve the state of the art until our new techniques are good enough to change the world. This particular hexayurt was built by a green building training course run by Greenworks, an Irish vocational training company. Ben Whelan of Cultivate, Bruce Darrell of Cloughjordan Community Farm and Ben Hutchison of INOX.ie (a stainless steel parts firm that has offices on site) helped with the build. We cut the parts with a table saw at BenH’s house, then took them up to the farm site and built the hexayurt (destined to be a tool shed) in about 3 hours with a team of about ten people. I was surprised how fast it came together, we’re getting better with each build, and the combination of multiple screw guns and parallel work on different parts of the building works very well. It’s all about multiple small teams working in parallel. I’m looking forwards to assembly-line style construction in the future, where we just crank these things out in stations with jigs. I think you could do about one person-day of effort per yurt that way, possibly less. Large teams could produce enough units for an entire refugee camp in only a few months, and the work is simple enough that even people with no construction experience can meaningfully contribute to the construction process, and those with some building skills are soon fully up to speed. It’s good, simple, direct work. 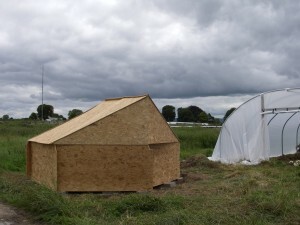 This hexayurt is made of OSB 3. We don’t have the floor finished yet – there’s talk of rammed earth or possibly some kind of gravel and carpeting solution (!) but as I say, “the wind and the rain are the same everywhere, but the ground is unique to each place you go.” I think that the H13 design is a truly visionary piece of architecture in that it combines the structural rigidity of the monocoque like the hexayurt, but the spatial utility of the roof ridge which efficiently generates walking-height interior floor space, all without creating a need for additional components. Good work, guys, and I’m hoping to prototype a polyiso foam/ferrocement later this year. I think there’s an excellent chance that a really simple approach – chamfer the edges of the boards, assemble with tape, wrap the outside with chickenwire, put wire/plastic ties through the foam to another layer of chickenwire on the inside, then brace the inside with wood while the outside is sprayed with concrete, let it cure then spray the inside – has the potential to produce a cheap, permanent, fully insulated hexayurt. Add an insulated concrete slab and we’d be in business. Also, I just want to note that the Burning Man hexayurt business is ramping up. Lots of different companies offering “hexayurt tape” (yes, they call it that), people beginning to trade hexayurts they don’t need any more, and talk of community mass production and a few made-for-sale units too. I’m very glad to see all of this, and as long as we can keep the business side civil, friendly, honest and fair, I could not be more glad to see this happening. Linux needs Red Hat to make it accessible for non-hackers, and we all need quality building materials at fair prices. Good work, guys, and I hope there will be some jobs coming out of the hexayurt ecosystem in years to come. Cool build, I’ve got a ferrocement yurt on order for a friend that wants a meditation hut. Been busy in the fray of jobs and bills and all that jazz, but week after next I’m hoping to get rolling on a ferrocement yurt. Will post details on swadeshi when I get some computer time, but gotta get back to this roof I’m doing…. There appear to be lots of seams with light coming through in this construction. I’m sure weather would come through there too! You could use a table saw to rip down some 2x4s lengthwise to fit the inside angles of the joints, and you’d get a much better seal and stability for the structure. I think they’d look pretty decent as well. Then if you paint the outside with deck paint and caulk the seams, you’d probably get some decent weathering out of it. 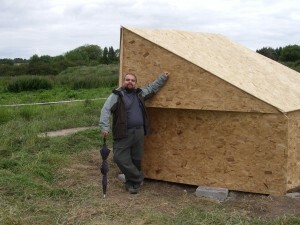 I’m curious what other techniques people would use to cheaply weatherproof such a structure. Good work, Vinay. But what advantage over a yurt? Mongolian yurt, adapted for Ireland, is an elegant design that withstands rain and wind, cheap to make on readily-available, low-impact materials. Easily moveable/storable. 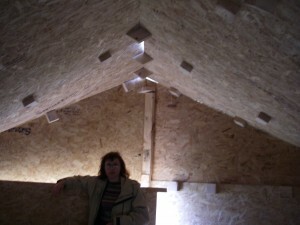 Ours is insulated with 100mm sheeps wool which works incredibly well. Jack, we did this one with vents at the bottom of the roof on each side – half of each roof piece has a 1cm airgap in the middle of each wall. If you don’t want those, you cut the flanges off each wall and put them into that airgap and it seals tight. Dierdre, the hexayurt has two big advantages over the conventional yurt. 2> You can build 100K or 500K units from the commercial plywood/OSB supply chain and not hit any resource scarcity, which is very handy for natural disasters. I’m building a small yurt, out of bamboo I gathered near my home, zipties, and I’m making my own tarp by fusing old grocery bags. First of all, thank you Mr. Gupta for sharing this information so freely and all of the work you’ve done. When I was first starting researching my project, I considered a hexayurt very seriously. It’s truly an awesome design! However my budget didn’t allow it (yeah my budgets that small, I’m unemployed) and after mulling it over and looking at a lot of ideas I went with a yurt. It made sense for me, since I have a stand of free bamboo, so long as I don’t care about looking silly to all the other suburbanites chopping it down on the side of street. I think yurts are great options, especially if you have bamboo or small diameter timber. But I’ll wait until I finish my project before I sing yurt’s praises anymore. For speed of building, reduction of waste materials, use of standard sizes, the hexayurt is supreme. It’s so much better than other reliefs ideas for Haiti I’ve seen floating around. Great photos of this elegant new design. Creating a heightened roof line and space by adding minimal additional material is inspired engineering. The documentation at http://www.appropedia.org/Hexayurt_H13_Plywood is basically there, and being improved on, incrementally. I hope it gets to be a useful resource. I like this hexayurt…..you have created amazing and wonderful design….good job dude.Nice photos….